I sold most of my bit coin last November and made a bit of a profit. Should I buy some more now it’s gone down in price? How do you reason under uncertainty? From a hermeneutical perspective we are always in an uncertain condition, though you might as well call it “contingency.” How you interpret, understand and act, depends on circumstances, which in turn draw on your background, history, the company you keep, the sense of your community (common sense), values, beliefs, habits, practices, the material circumstances of the moment, and of course, advice. How we interpret, understand and act may be embedded in our practices without reflection, or they can be the subject of a concerted process of decision making, hesitation, debate and dispute with or without resolution. For hermeneutical scholars such as Hans-Georg Gadamer, to interpret, to understand and to act (apply our understanding) are the same process. To understand a situation is to act in it. If there are stated rules and norms, then their application is also contingent, a matter of interpretation. Formal logic rarely comes into play or decides the matter, or, at least, logical deduction is rare, where one proposition follows another in an inevitable chain of inference. For C.S. Peirce, reasoning is mostly abduction, a reverse process of inference by which we try to create the situation about which inferences could be made to deduce a conclusion — a conclusion that we assume ahead of time. Peirce explains the primary role of abduction in human reasoning. The ubiquity of abduction fits the hermeneutical model, as long as we don’t feel the need to adhere to formal logic (as does Peirce) in defining what it is to reason, judge and think. Indeed, for Peirce, we exhibit abductive judgements via a range of processes, not least is the sudden flash of an understanding (a “hunch”) that is not the result of a formal process. “The abductive suggestion comes to us like a flash. It is an act of insight, although of extremely fallible insight. It is true that the different elements of the hypothesis were in our minds before; but it is the idea of putting together what we had never before dreamed of putting together which flashes the new suggestion before our contemplation” (227). He adds that this kind of abduction is “a process not sufficiently conscious to be controlled” (227). (See post about thinking fast.) He declares that if we were to subject this abductive process to logical analysis then we would have to accept that it follows a chain of inferences that never ends. In fact, “because it is subconscious and so not amenable to logical criticism, does not have to make separate acts of inference but performs its act on one continuous process” (227). The instantaneity of such sudden (abductive) insight testifies that something is going on other than formal logical processes. That is not to trivialise or mystify such apparently instantaneous processes. We interpret, judge, decide, act from moment to moment, and all the time. For the purposes of argument, I am content to equate Peirce’s concept of abduction with hermeneutical concepts of interpretation. Conceding to C.S. 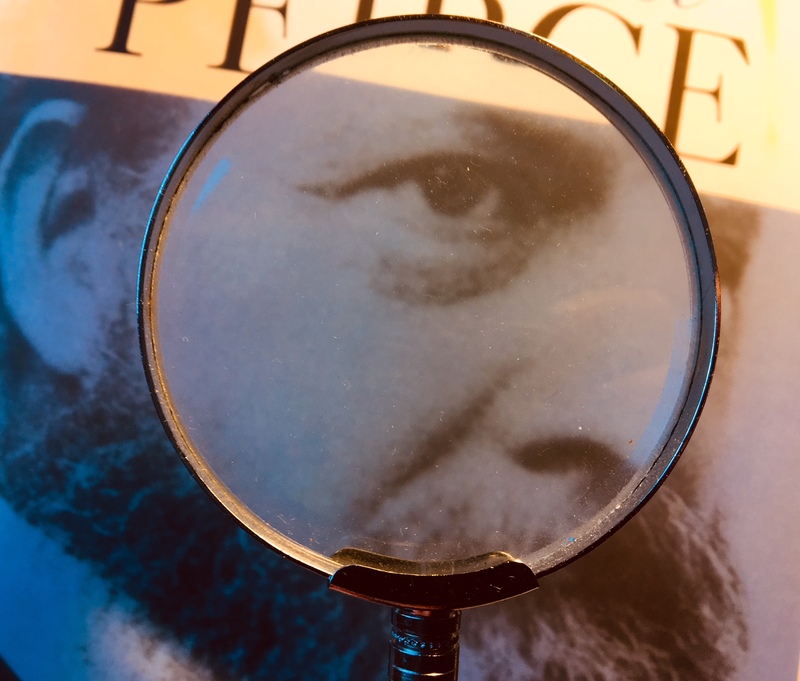 Peirce the centrality of semiotics, abductive reasoning inevitably brings signs into play at some stage, as we gather evidence, during the thought process, in conversation or in retrospect as we justify our interpretations, understandings and actions. A helpful (online) article by Gary Shank and Donald Cunningham outlines 6 modes of abduction consistent with Peirce’s categories of the sign. They use the term “evidence” throughout. Signs go to make up the evidence that informs an abductive inference. To paraphrase the first part of their article, abductive interpreters can follow a hunch (or make a guess), taking their own unarticulated feelings about a case as evidence. This is a qualitative assessment with little apparent ground. It is a raw and poorly articulated feeling, as described above. But in abduction we can also follow the evidence of a symptom; or move from one frame of reference to another via analogy or metaphor; we can pick up clues, as does the investigator of a crime (according to detective stories); we can formulate a diagnosis compiled as a set of clues; and/or we can follow the route of ascertaining facts on the basis of how they can be woven into a plausible narrative or explanation. It is helpful to review these modes of abduction, or sources of evidence, in relation to Peirce’s ten sign classification system. Deduction seems to pertain to the notion of argument — number 10 faded out on the diagram. This is the evidence gleaned from strict logical inference. Induction pertains to the notion of the dicent (4, 7, 9), a complete qualitative expression (e.g. all men are mortal, all swans are white). Abduction belongs to the rheme, which is an “open propositional function” according to Shank and Cunningham. Most types of sign with which Peirce is concerned fall into this category. Here are six categories of evidence by which we abduct (i.e. interpret). Hunch (1. Rhematic Iconic Qualisign) An omen or a guess. A qualisign is that aspect of a particular sign that delivers the information irrespective of the medium in which it appears. So it is a raw feeling that something seems right, as described at the start of this post. Symptom (2. Rhematic Iconic Sinsign) A possible resemblance. The sign resembles in some way the object to which it draws attention. This type of sign is a one-off: the rash looks like a disease of the skin. Metaphor (5. Rhematic Iconic Legisign) A sign that belongs to a new frame of reference. I thought of the building I was designing as a cave until someone pointed out that it is more like a citadel. Clue (3. Rhematic Indexical Sinsign) What a detective does. A raw, spontaneous cry that does not belong to any particular language convention, such as the cry of a baby, a shriek of pain, a laugh. A red stain on the carpet could be blood or red wine. There’s something like a causal connection between the sign and its object. Diagnosis (6. Rhematic Indexical Legisign) Scenario formed by a set of clues. This pertains to the generalised idea of the index, a set of connected signs that appear as if caused by a set of objects. To diagnose a condition is to establish causes. Explanation (8. Rhematic Symbolic Legisign) A story connecting everything together. It is counted as evidence because it fits the narrative. I’m still trying to find out how and where Peirce makes these precise correlations in his writing, whether they include every candidate for abduction, and how algorithms that work with abductive probabilities fit this schema — assuming the schema is right. Peirce, Charles Sanders. 1992. Pragmatism as the logic of abduction. The Essential Peirce, Selected Philosophical Writings Volume 2 (1893-1913): 226-241. Bloomington, IN: Indiana University Press. Shank, G. and D.J. Cunningham. (1996), ‘Modeling the Six Modes of Peircean Abduction for Educational Purposes’. Indiana University. Available online: https://www.cs.indiana.edu/event/maics96/Proceedings/shank.html (accessed 2 February 2018). In the case of deciding whether or not to buy more bitcoin: the idea of the hunch obviously applies. I hear of people funding their university study by making a windfall on crypto currency. Perhaps that’s evidence from financial reward as a symptom. Charts going up and down (lately down), bubbles and cliff-edge metaphors support certain types of evidence. I might look for clues in the paucity of merchants that accept bitcoin, adjustments in bank policies, what’s happening to the stock market. Commentators diagnose what’s wrong or right about currency markets, in a cause and effect kind of way. I select evidence that conforms to a narrative or explanation: it makes sense that things level out, the value couldn’t rise for ever, there’s justice in watching speculators get their fingers burnt. That kind of thing. There’s a bit on the relation between signs and inquiry in Awbrey & Awbrey (1995). Thanks. I’ll look them up. Do you concur with Shrank/Cummingham’s translation of Pierce’s terminology: 1) Open Iconic Tone; 2) Open Iconic Token; 3) Open Iconic Type; 4) Open Indexical Token; 5) Open Indexical Type; 6) Open Symbolic Type; 7) Singular Indexical Token; 8) Singular Indexical Type; 9) Singular Symbolic Type; and 10) Formal Symbolic Type? Certainly, a more familiar nomenclature, but does it carry dubious approximations of Pierce’s semiotic concepts? I ask because significant interpretive latitude opens with this terminology shift. Have you, would you, assimilate their translation into your own teaching or investigations? Good point. I’m trying to stick with Peirce’s terms for the time being. I’m getting used to them. I would use S&C’s terms to help explain Peirce’s. The Shank Cunningham paper makes reference to articles in the the Harvard edition of the collected papers of Peirce (1931-1958), which I don’t seem able to access from libraries or online. So I’m not 100% sure which articles they are referring to (e.g., 2.205 is from Volume 2, paragraph 205). Also they mention in the first paragraph something in press. Do you know what that is? It seems also that this online paper wasn’t published in a journal … or was it. Do you know? The material in CP 2.254–264 is from MS 540 “Nomenclature and Divisions of Triadic Relations, as Far as They Are Determined” and can now be found in EP2 Chapter 21. Thanks for the reference Jon. I’ll look it up when I’m back to my library. take up Peircean abductivity at some length … so it might be the full text of the paper summarized and may also contain a fuller bibliography.